Microsoft announces Windows 10 Lumia smartphones and Surface Pro 4 tablet | What Hi-Fi? Microsoft has unveiled two new Lumia smartphones, the first to run Windows 10, plus a new 12.3in Surface Pro 4 tablet, a Surface Book hybrid and more details on its HoloLens project. Starting with the phones, Microsoft has given us the Lumia 950 and Lumia 950XL. The XL comes comes with an octa-core Qualcomm Snapdragon 810 processor with 3GB of RAM. Couple this with Windows 10 and the 950XL should be pretty speedy. Elsewhere there’s a 5.7in Quad HD OLED display with 518 pixels per inch (ppi) and a 3340mAh removable battery, making Microsoft one of the last remaining manufacturers to allow you to swap the battery out. On the back of the XL there’s a 20MP PureView camera with optical image stabilisation, a triple flash and a 5MP sensor on the front. Internal storage comes in at 32GB, but Microsoft has fitted a microSD card slot for expansion. The USB type-C port allows for quick charging and a universal fit, or alternatively you can charge wirelessly thanks to Qi technology. Other features of the 950XL include iris recognition for improved security, and compatibility with the new Surface Pen smart stylus. 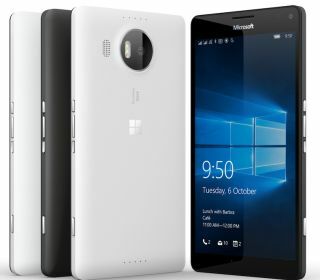 The Microsoft Lumia 950XL is available to pre-order in the US in black or white for £549. The Lumia 950 meanwhile comes with a 5.2in Quad HD display, hexa-core Snapdragon 808 processor and 3GB of RAM. Other specs include a 20MP rear-facing PureView camera, 3000mAh battery and 32GB of expandable storage. Wireless charging, iris recognition and USB type-C also carry over from the 950XL, as does the polycarbonate body. No metal here unfortunately, but the casing should make for a more rugged phone. The Microsoft Lumia 950 is available to pre-order now for £500. Meanwhile, the Surface Pro 4 has been announced to rival the Apple iPad Pro. The Pro 4 comes with a 12.3in display and a new sixth generation Intel Core processor, up to 16GB of RAM and up to 1TB of storage. Microsoft says the Surface Pro 4 is 50 per cent faster than an Apple MacBook Air. Other specs include a nine-hour battery life, a slim 8.45mm body and the new Surface Pen. The Pen comes with a rubber on the back, for erasing out mistakes on screen, interchangeable tips and more accurate calibration on the screen. The Microsoft Surface Pro 4 will be available on 26th October from £750, with prices rising to £1799 depending on RAM and storage configurations. You can view all the prices and configurations here. Microsoft also announced updates to its HoloLens headset, revealing that a developer's kit will be available in the first quarter of 2016 for $3000. It also introduced a new demo of a game called Project X-Ray, which requires the player to use a holographic arm canno to shoot robot scorpions crawling out the walls. At the moment, the HoloLens dev kit is only available in the US and Canada, with not mention of when other countries can expect to get their hands on it. Other new products unveiled by Microsoft included the Surface Book, the company’s first ever laptop, which is able to transform between laptop and tablet thanks to an articulating hinge and the Microsoft Band, a health, sleep and calorie tracker. It features a curved OLED screen and works with iOS and Android devices as well as Windows.